Synopsis: Elizabeth Rew is the new girl at a new school after her father remarries and their money has to go toward her stepsisters’ tuition. So when her teacher offers her the chance to work at the New York Circulating Material Repository, she jumps at the opportunity to get some extra cash and make new friends. The Material Repository is home to hundreds of objects from knight’s doublets to Marie Antoinette’s wigs, and the holdings include The Grimm Collection, a storehouse of mysterious fairy tale objects collected by the Grimm Brothers. Turns out, there is more to the collection than meets the eye, and someone is stealing the objects to try to turn a profit and Elizabeth and the other pages have to find the thief before the collection gradually disperses. Why I picked it up: The New York Circulating Material Repository sounds like the kind of library that I would want to work in. 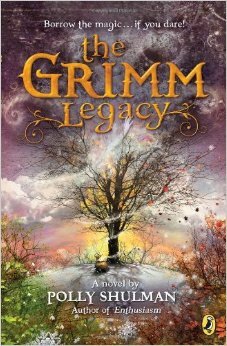 Why I finished it: The book is given a modern setting, but it draws a lot on the European fairy tale tradition and makes the story seem almost like a fairy tale in and of itself. It’s easy to see the Elizabeth is a sort of modern Cinderella, being made to wear hand-me-downs and do housecleaning while she deals with not having many friends at school. She’s also an ideal heroine because she is equal parts, brave, curious, and vulnerable without being a damsel in distress. She plays to her strengths and uses her passion for myth and legend to solve the mystery of how to catch the thief stealing from the Repository. The Repository is arguably one of the most extraordinary libraries that I’ve read about and it follows in the grand tradition of being full of treasures of all kinds. While Schulman describes the Repository as a place not full of books but of objects, it still demands the sort of reverence of its patrons and staff as a traditional library or even a museum. Mystery and magic abound in this story about finding your place, friendship, and finding the extraordinary in the ordinary. 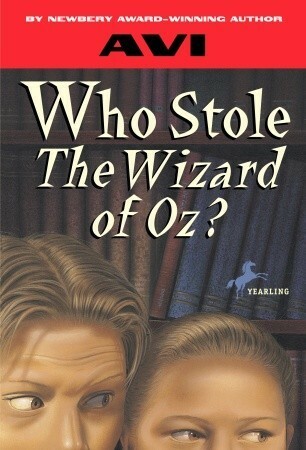 Synopsis: When Becky is accused of stealing a rare copy of The Wizard of Oz from the library, she and her twin brother Toby set out to catch the real thief and clear her name. What they discover is that the stolen book is one of four that hold clues to a mysterious treasure, one that could help its finder find happiness. Why I picked it up: I am a huge fan of Avi’s work, but I have yet to make my way through his entire body of work. Why I finished it: This is a clever mystery crafted around a collection of books that at first glance don’t seem to have much in common. Becky and Toby have just started their summer vacation and while they’d prefer to be doing something else, the two find themselves reading through books and hunting around town to learn more about what hidden treasure could be just around the corner. Both children are quite clever, but there isn’t a whole lot of character development beyond these revelations. Avi appears to be more focused on building the mystery, and while it’s enough to keep the reader turning the pages, I was a little disappointed that I knew more about the town shut ins than I did about our main characters. 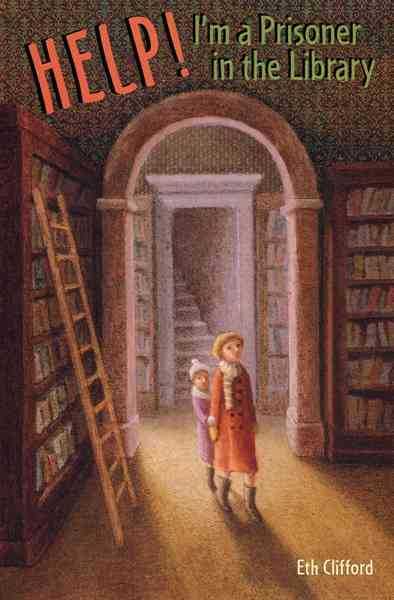 The small town in which the book is set comes across as quaint, and Avi works the town’s own little oddities into the mystery and it is a clue hidden in another book that aids in leading Becky and Toby to the treasure. It’s a quick, fun read that engages the reader in discovering the power of books and how there is no such thing as useless information. Synopsis: When their father’s car runs out of gas on the way to visit their aunt, Mary Rose and Jo-Beth knew it was going to be a long night. But when they get trapped in a library after they go in to use the bathroom, all they want is for the night to come to an end. For one thing, the library is in a super old mansion. Plus, after the lights go out from a storm, the girls must investigate the strange noises coming from upstairs. Are they trapped or can they find the librarian to let them out? Why I picked it up: I love a good library story and this one had a particularly unique mystery element. Why I finished it: To be honest, I don’t know what I would do if I was trapped in a library all night (actually, that’ a lie – I would build a castle out of the non-fiction books and then find a nice corner in which to read), but I can imagine that it would be a little bit scary – especially if the building is older. But Mary Rose and Jo-Beth discover that they are much braver than they think they are as the night goes on. They must contend with life-like dolls that seem even more creepy in the darkness, a large mynah bird that asks them pointless questions, a cranky librarian, and a mysterious howl that is coming from the basement. The relationship of the sisters really comes across on the pages: they love each other, but the younger wishes she wouldn’t get bossed around so much and the older wishes her younger sister would just listen to her. Clifford’s imaginary children’s library actually sounds like it would be a cool place to visit, and there are a number of children’s museums around the country that house so many of the displays that Mary Rose and Jo-Beth encounter in the library. It’s a cute book about two sisters overcoming their differences, if only for a little while, and learning to appreciate each other’s strengths. Synopsis: Emily lives in the small town of Pitchfork, Oregon and she is intrigued by the stories of a library in the town of Portland where her cousin Miriam lives. Determined to bring a library to her small town, Emily enlists the help of her mother to write to the state capital in order to get some books and the help of the townspeople to help raise some money for a space. 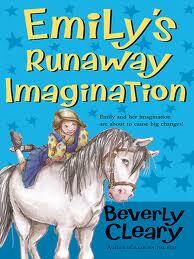 Will Emily’s enthusiasm and spark be enough to help make a dream come true? Why I picked it up: I loved Beverly Cleary as a kid, but somehow skipped over this book when I was eating through her body of work. Why I finished it: This story has Cleary’s trademark quirky main character with a big heart and the desire to do the right thing. Set during the 1920s, the story has an element of historic fiction to it, detailing life during the decade before the depression and a little bit about the early free library movement. Emily is clearly enamored with the idea that one can borrow books as often as they like and then bring them back. Having a library in her small town would mean that she would be able to read about the things her cousin talks about in her letters. Of course, having a highly active imagination also helps keep Emily’s life interesting: she dyes a horse white with bleach, feeds fermented apples to the family pigs, and even manages to accidentally win a costume contest. While readers might not relate to the times in which Emily lives, they will be able to identify with Emily’s curiosity and desire to spice up life in her small town where nothing too horribly interesting seems to happen. Emily likes to think outside the realm of the ordinary and it encourages readers to create their own adventures and find what makes their own towns special. Filled with humor and heart, this story is perfect for a summer read or even just a good choice for curling up with a cup of tea on a cold day. Synopsis: Mongoose, Brenda, Sonseray, and April have nothing in common until a little blue card makes its way into their pockets and changes their lives. This mysterious little card becomes their key to staying out of trouble, remember who they are, remember where they came from, and figure out where they are going. In these stories, these four tweens discover the possibilities and the magic that only a library can offer. Why I picked it up: The title caught my eye while I was book hunting in a local used book store. Why I finished it: I could wax poetic about the magic that a library card exposes us to, but it’s really something that must be experienced for oneself, much like Mongoose, Brenda, Sonseray, and April. Mongoose is a kid who is on the verge of becoming a vandal and dropping out of school when the little blue library card appears in his pocket. Brenda is having some serious withdrawals when her school institutes a TV Turn-Off when the blue library card appears on the floor of her room. Sonseray is an angry teen who resents his uncle and misses his dead mother when he picks up the library card on the street. 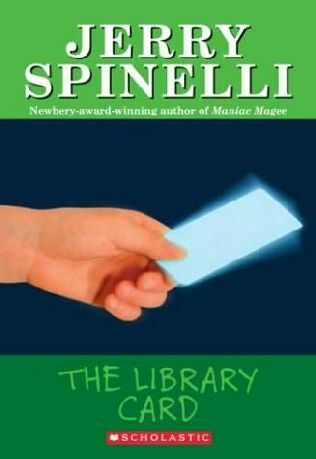 April has just moved to a new home and gives her old library card to a new friend, causing it to transform into a new card for a new beginning. There are so many things that make this book special, but the two things that stuck out to me was the realism of the character’s socioeconomic status and the understanding of the librarians as they interact with these four patrons. It’s easy to pass off these kids as different, but by showing their differences and their struggles, Spinelli gives them room to grow, mature, and evolve into completely different people by the time their stories are concluded. The librarians are patient and seem to speak the fast-talking language of the tweens they come in contact with in each of the stories. Spinelli shows us that even the most modest things can evoke the greatest change in our lives and create new opportunities that we never thought were possible. 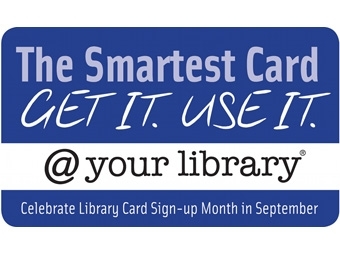 So if you don’t have a library card, sign up for one and see what it can do for you. Random House Books for Young Readers, 2013. 978-0375870897. Synopsis: Kyle Keeley loves games: board games, word games, strategy games, memory games; you name it, he’s played it. 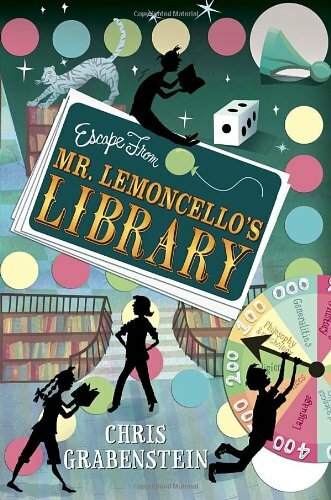 So when he hears that his game-making hero Mr. Lemoncello is designing the town’s new library, he jumps at the chance to enter to win a spot in the exculsive sleepover the weekend before the library’s grand opening. Turns out, getting in to the library is easy; getting out will take a little more strategy. Why I picked it up: Well, I could say that it is just because it takes place in a library, but there’s a little more to it than that…. Why I finished it: Grabenstein has taken one of America’s oldest and most loved institutions and given it a makeover. Yes, the library is a place for books and games, but in the last ten years more than ever, it is also a place for technology. Our characters have grown up in a town without a library and the invitation-only lock in is a way for the twelve seventh graders to learn about what the library has to offer. True, it’s much more hi-tech than most libraries I know, but that is another part of what the characters are learning about during their night at the library. What touched me the most was the game creator Mr. Lemoncello’s story about how he had been an immigrant and it was a librarian who gave him his first book, helped him learn better English, and encouraged him to become the famous game maker he is in Grabenstein’s book. I would even go so far as to say that this book encapsulates many of the reasons libraries are still needed in our schools and in our communities, and proof that spending time in a library can be a rewarding experience. It’s a mystery that is very well crafted throughout, never leaving the reader with a dull moment.